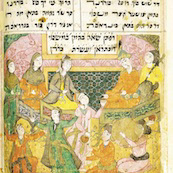 Shahin’s Ardashir namah, depicting Shah Ardashir in his harem, with dancers, musicians, and his wives. 17th Century. Courtesy of Center for Iranian Jewish Oral History and Women’s Worlds in Qajar Iran. The project has twice received funding from the NEH Division of Preservation and Access, and hopes to explore the influence of the long-lasting Qajar Dynasty by studying the women who lived in Iran from 1796 to 1925. Afsaneh Najmabadi, the project leader and a Professor of History and Women, Gender, and Sexuality Studies at Harvard University, believes her work will be helpful for understanding Iran’s current cultural and political issues. Najmabadi heads a team of students and scholars who are sifting through over 20,000 primary sources, including poems, essays, travelogues, private letters, photographs, works of calligraphy, marriage contracts, and legal documents. The collection includes notables such as poetry penned by Zib al-Nisa’Baygum, daughter of the sixth Mughal, precious jewelry worn by women of wealth, and a copy of the Qur’an written by a female calligraphy artist. 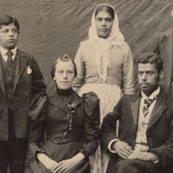 Group portrait of a physician, his wife, and servants who lived in the late Qajar Dynasty. Undated. Courtesy of Women’s Worlds in Qajar Iran. 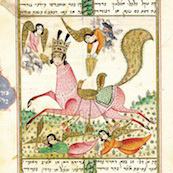 “Women’s Worlds in Qajar Iran” was recognized by the White House Office of Public Engagement in 2012 as an example of scholars using NEH funding to research the history of Muslim women’s rights. The archive complements the NEH’s Bridging Cultures initiative, which seeks to promote understanding and mutual respect for people with diverse histories, cultures, and perspectives within the United States and abroad. Jami’s Yusif and Zulaykha (otherwise known as Joseph and Potiphar’s Wife). 1853. Courtesy of Center for Iranian Jewish Oral History and Women’s Worlds in Qajar Iran. This entry was posted in Uncategorized and tagged communities, community, culture, education, Harvard University, historical preservation, history, humanities, National Endowment for the Humanities, NEH, NEH Office of Congressional Affairs, preservation, Qajar Dynasty, research, resources, Woman's History Month, women, Women’s Worlds in Qajar Iran, Women’s Worlds in Qajar Iran: A Digital Archive and Website by nehblog1. Bookmark the permalink.